Taking pictures of a work is very helpful. Sometimes you fall in love with a part of it in the making, and it's hard to let go of that little teeny brushstroke. So you end up accepting something you hate to preserve that little teeny thing you love. Or you go back and repaint the whole thing. 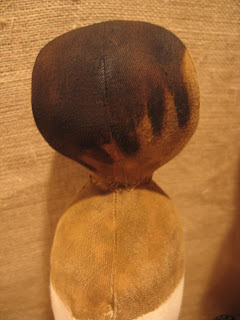 The dolls above are a result of my challenge to make an Izannah pattern. The first is completely made of cloth. 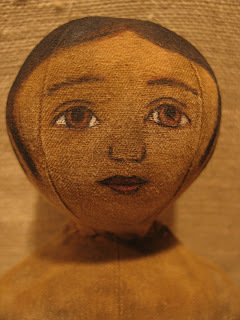 The next doll is paperclay over cloth. She may be a candidate for repainting. At least her eyes need to be repainted, they are way too dark. And perhaps the whole thing will be gessoed for another go. 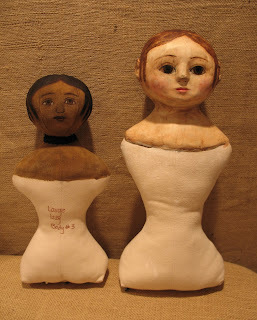 I think you get better and better as you create your delightful dolls. You are such a talent !!! She is so sweet. Drop by my blog, I nominated you for something! Have a great weekend! These girls are absolutely wonderful. Thanks for the body design lessons too! i agree with Dawn; I love the sweet face - her eyes are soulful and very expressive. Your talent is exceedingly lovely. Dixie, you're little girls have the sweetest faces....what a talent! I think both dolls are looking wonderful Dixie! 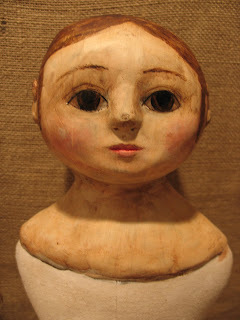 The soft details you have achieved on the paperclay doll are very nice, and I love her face, and her soulfull eyes!! I love them. Your faces are wonderful! !